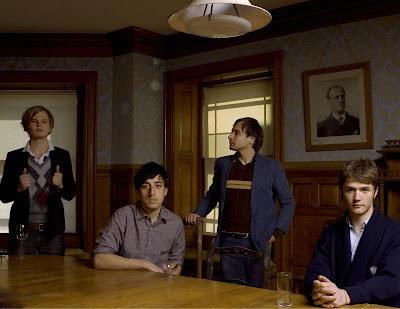 Grizzly Bear is a Brooklyn based band who released their third studio album, Veckatimest, May 26, 2009 on the Warp Records label. Unlike the majority of the labels’ roster (Aphex Twin, Autechre, Jamie Lidell etc. ), Grizzly Bear incorporate computers, traditional instruments and beautiful vocal harmonies reminiscent of The Beach Boys’ album Pet Sounds. The band opened up for Radiohead during the second leg of their North American tour last year. Johnny Greenwood even declared his love for Grizzly Bear, on stage, calling them his favorite band. Now that’s an endorsement! Here’s the mp3 for the song Two Weeks and a very cool video filmed on the streets of Paris featuring Grizzly Bear doing an A cappella version of the song Knife off of their 2007 album, Yellow House. i'm not sure if you've heard of black cab sessions, but it's one of my fave sites to hear and leave on the background while working at home (besides OTR, hype & pandora). the site always make me want to change my bath tub for a taxi cab, all the songs sound acoustically delicious. check Grizzly Bear's sessions as they play 'All We Ask' one of the best songs on 'Veckatimest' and one of the best albums so far of 2009! http://www.blackcabsessions.com/sessions.php?id=1243002825.